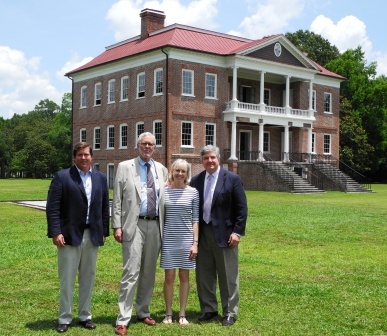 From left to right: Kristopher King, site advisory council member; President of the American Alliance of Museums Dr. Ford W. Bell with his wife, Amy; and Drayton Hall Executive Director Dr. George W. McDaniel. Speaking to Drayton Hall’s site advisory council, Dr. Bell stated that the primary role of the organization is to provide a unified voice regarding the role of museums in society. The AAM has intensified its efforts to communicate the value of museums to increase federal funding. Museums are educational institutions but are often recognized as amenities. Dr. Bell recommended that members of our site advisory council read the AAM’s recent report “Building the Future of Education—Museums and the Learning Ecosystem,” which describes how museums impact the future of education. He noted that there is very little state funding available, and most museums depend on the generosity of individual donors and corporations. In closing, Dr. Bell thanked the members of our council for their great work.